TableTopGuild is running a campaign on Kickstarter in order to fund a new Beginner's Training Terrain Set, designed to help new gamers figure out the rules for terrain in various gaming systems. How many of us, when we first started out playing tabletop games knew what a Linear Obstacle was? How about LOS (Line of Sight)? This set of terrain is for those just starting out in the fabulous world of gaming! 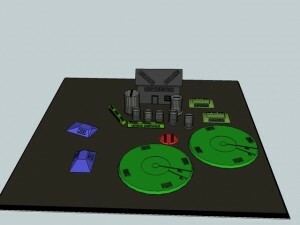 Our goal with this KS is to provide the "newbie" with durable, cohesive and concise terrain designed to educate. Made of high quality, light weight plastic resin, the TTG Trainer is a perfect gift for enthusiasts of all ages.